Sun Dogs and Halo Over Sepulcher MountainThe author of Skywatch West: The Complete Weather Guide, introduces the chapter on halos and sundogs with a quote from Shakespeare's Henry VI, "Dazzle mine eyes, or do I see three suns?" Today, I was rewarded for venturing outside in below zero temperatures with the dazzling sight of the three-sun phenomena, called parhelia (Greek for 'beside the sun') or more commonly sundogs. During my stroll up Old Gardiner Road, I had an excellent view of one of the sundogs over Sepulcher Mountain; the red and bluish light banished the whiteness of cirrus clouds, opening a door into the sky. At one point, it appeared that I could step through that door from the top of Sepulcher into a wondrous universe--and I was tempted to try. Sun dog in Tuolumne MeadowsIce crystals refracting the sunlight create sun dogs and halos. The two hexagonal crystal types most likely to create these optical phenomena are shaped like six-sided wafers and columnar pencils. Both have eight surfaces capable of refracting light. As depicted in the photo with this entry, sundogs and halos can accompany each other. Sundogs appear in a diverse cross-section of history and literature, as a entry in Wikipedia demonstrates. Artistole's work mentions "two mock suns," and Cicero's On the Republic examines the parhelion. In The War of the Roses, the appearance of sundogs was viewed as an omen of victory for the Yorkists. In modern times, sundogs appear in Nabakov's novel, Pale Fire, provides the title for a Stephen King novella and Jack London short story, and even warrant a mention in the rock group Rush's song "Chain Lightning" (band member Neil Peart is a weather fanatic). Being a dog-lover, I wanted to know the origin of the name and oddly enough most of my weather books remained mute on the topic. But I dug up the answer in my Weatherwise magazine archives (yes, I am that much of a weather geek). In the November 2002 issue, author Stephen Wilk answers the question 'whose dogs are the sun dogs?' in the article "Every Dog Has Its Day." He provides a few explanations, one of them being that the Germanic sky god Odin possessed two hounds/wolves, Geri (Ravener) and Freki (Glutton). For more information on sun dogs, you can read an excellent description on The Weather Doctor's site. Sierra Wave Over Half Dome (Shad Stites)Cloud-watching ranks as one of my favorite pastimes. Much like birding has its "life-list" species, cloud gazing also boast some premiere sightings. In my opinion, one of the most spectacular clouds is the Sierra Wave, an enormous lenticular cloud that stretches over the Sierra Nevada Range; it's formed by a complex pattern of the wind interacting with the surrounding terrain. My partner Shad took a recent photograph of a Sierra Wave over Half Dome in Yosemite. Over seven years ago, Shad and I were hiking on the Kuna Crest in Yosemite when we saw our first wave--although at the time I had no idea what the monster cloud above us represented. Aside from its striking appearance, the cloud possesses a fascinating history that involves the famed explorer Clarence King, the first cooperative international meteorological study, and a record setting ascent in a sailplane. The sky expresses itself in a poetry of clouds. That poetry resounds with a nautical flavor, for the sky is an ocean of air, an ocean we tend to forget for its invisibility. This sea of air does reveal itself in the clouds at times, its complexities and motions made perceptible. In a sense, clouds are the waves of the air, the visible manifestations of the atmospheric tide. The Sierra Nevada adds its own special verse to the poetry of the sky. Known as the Sierra Wave, this cloud formation perfectly illustrates the sea above our heads. Imagine staring up at the sky on a clear day and being confronted by a white cloud that challenges the reach of the mountain range before you. Or suppose that you are standing beneath a giant crest of surf on the verge of breaking. Such is the Sierra Wave. " Clouds always tell a true story, but one which is difficult to read," said meteorologist Ralph Abercromby. The story of the Sierra Wave not only reveals the truth of the weather behind a cloud, but it also discloses a landmark tale of scientific discovery. Want to read the full story? 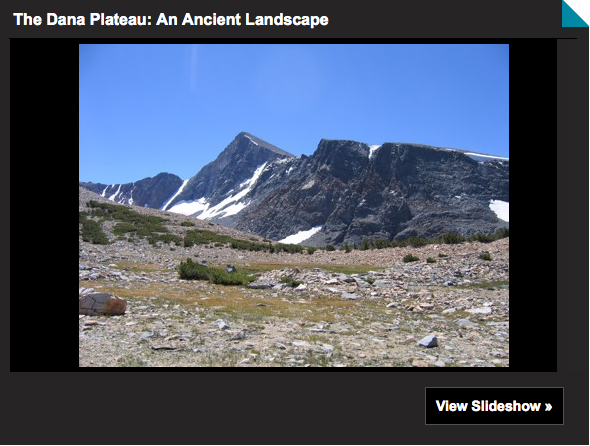 Visit Sierra Nature Notes. You can also check out some of my old blog entries on the Sierra Wave. Visit the website of the very talented photographer Bob Kolbrener for a spectacular black and white photograph of the cloud. My car is slowly being consumed by snow--we're going to attempt to drive back to Yellowstone this afternoon. I regret not bringing my skis as it would be easier to ski than drive through the Beartooths. 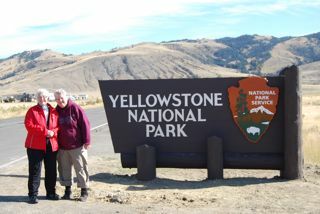 Tre and Susan, two of my good friends from California, visited me this week in Yellowstone. 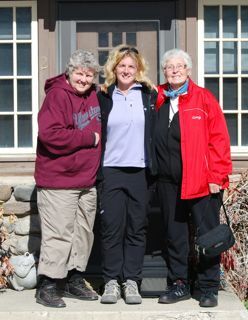 We enjoyed warm autumn weather for most of their trip, but a storm system is moving into the region tonight. After reading the forecast calling for 6-12 inches of snow, my friends promptly fled south—I had to exercise self-control not to join them. My winter anxiety became heightened since the special weather statement announced, “fall weather is about to come to an end with a sudden switch to winter conditions.” I guess I’ll pack my shorts away until next July! Rainbow on Shoulder of Mt. Everts My new nickname for Mount Everts is “Rainbow Peak.” After two recent thunderstorms, rainbows have decorated the shoulder of Mount Everts, bathing the hillsides in an ethereal light that resembles the mythologized landscape of an Albert Bierstadt painting. 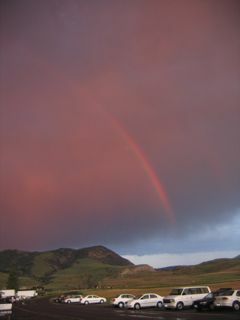 One of the appearances included a primary and secondary rainbow. Remember the song we learned in grade school: “red, and yellow, and green, and gold....?” According to the book, The Rainbow Bridge, although we recognize discrete bands of color in the bow, the number of actually hues can be indefinite, with shades imperceptible to our sight hiding in between the bands. The wind wanders restlessly today, and its movement reminds me of the ocean of air above me. Currents and eddies, ripples and waves, swirl overhead, visible only when clouds betray their secret travels. I’ve been working at my desk today, and enjoying the view of cumulus clouds gathering around Electric Peak, and of the wind rushing through my window, reminding me of the gathering storm outside. I am hoping for a natural firework’s show tonight, nature’s delayed Fourth of July celebration. Nothing mesmerizes me as much as watching a thunderstorm. To some, storms are an annoyance, to others a danger—for me I am utterly admiring of such a terrible, beautiful force--as long as I am happily situated in a safe location! When hiking the John Muir trail, I once got caught at 12,000 feet on Pinchot Pass when an unusual morning thunderstorm suddenly struck. I still remember the crackle in the air, my body hair standing up on end, and my ears ringing from what sounded like gunshots firing next to me. At that point is was all dependent on luck whether or not I survived. Some fun lightning facts: Over 8.6 million lightning strikes hit the ground each day (which works out to 100 strikes per second). The temperature of a lighting bolt can also reach a level five times hotter than the surface of the sun. A bolt can also travel up to 7 million mph. All of these speak to the awesome force one witnesses when gazing a thunderheads on the horizon. One last fun weather fact for the day: Montana holds the US record for weather extremes. The highest temperature in Montana was recorded today in 1937, while in January of 1954 a record 70 below zero registered on the thermometer. The range of 187 degrees between the two extremes is the largest in the United States. I do not have enough photographic skill to capture lightning (that requires knowledge of foreign concepts like apreture and shutter speed), but I've included photos of some of my favorite storms. Truly a spectacular weather watching evening. 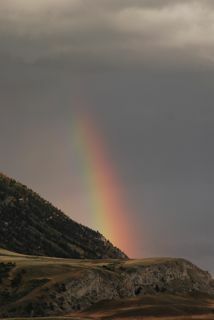 A thunderstorm raced into Yellowstone and painted the sky with a spectrum of color. I watched the landscape and sky change from blue to gold to black to pink. And as if the cloud's display of color wasn't enough of a delight, a magnificent rainbow suddenly appeared to complete the scene. Cumulus clouds have been building almost every afternoon for two weeks near my home, but not until today did I get to watch a true thunderstorm. Electric Peak finally lived up to its name---streaks of lightning danced over the peak amidst a dark grey backdrop of storm clouds. Last week on a trip to Bozeman I found a treasure in a used bookstore--the book Montana Weather: From 70F Below to 117F Above. For a weather junkie like me, this was a great find. Published in the early 1980s, the book has numerous delightful chapters including: Montana Twister, Surviving West Yellowstone in Winter, and Great Falls' Wonderful, Winterless Winter (where I wish I could relocate after this winter!). According to the book, "the soldiers who manned old Fort Yellowstone used to say that 'in Yellowstone there are only two seasons, winter and July.'" That's certainly been the case this year! The last two days I’ve been attending a conference on transportation strategies for the Greater Yellowstone area at the Grand Teton Lodge, sponsored by the Yellowstone Business Partnership. The keynote speaker, Todd Litman, provided some inspirational and thought provoking ideas about our perceptions of transportation—he is the founder and executive director of the Victoria Transport Policy Institute. 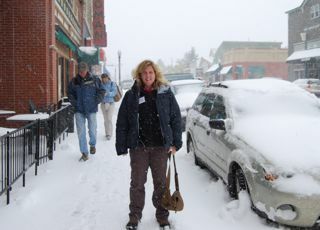 I attended other interesting sessions on transportation in national parks, “smart streets,” and regional trail networks. The Grand Tetons lent the conference a spectacular setting. The main room at the Grand Teton Lodge has a breathtaking view of Mount Moran in its enormous floor-to-ceiling window. Moose and grizzly bears often wander on the property. Last night I stood outside of my room and watched the first thunderstorm I have seen since leaving California. Lightning danced on the high peaks and the downdraft from the energetic clouds felt wonderful (and not chilly!) on my face. Mount Moran, pictured at right, stands 12,605 feet high and was named for the famed landscape artist Thomas Moran. See my local forecast below. Someone has kidnapped the sun. Please send help! I'm now a proud member of the Weather Underground network of personal weather stations. Now I can see just how cold it is outside and share my misery with thousands! When you think of me, you can visit my station and observe the wind speed or dew point at my house. I'm sure you're all just as excited as I am at this new way to stay connected. Yellowstone is truly a cross country skier's paradise. I glided on soft powder from last night's snowstorm while relishing the expansive views of the surrounding basin. I have no idea what peak is pictured at left--my guess from the topo map is Bunsen or Sepulcher. The clouds rising over the white hills looked like the snow trying to escape into the sky. 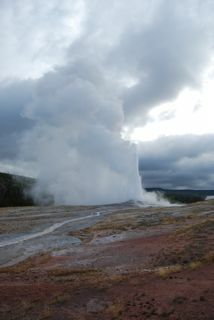 The rolling terrain appeared endless--the scale of the Yellowstone area is somewhat daunting as Yellowstone is almost three times the size as Yosemite. During my ski, I waved as I passed several napping bison, and stopped to examine some coyote tracks. The sunshine and blue skies were welcome after the constant snowstorms we've been experiencing. 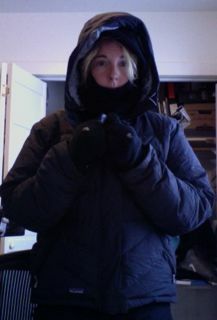 I am also happy to report that after this trip I have officially adjusted to the cold. Even at 18F today, I skied in only my base layer with long underwear, and no hat--and I was hot! When I arrived home, three mule deer greeted me in my driveway. Apparently the Ungulate Festival has not finished yet. And here's the sunset over Electric Peak from my front porch tonight. Truly, a beautiful morning. Even in the bitter cold I had to stand outside and admire the full moon gazing out of a purple sky as it gently shone over Gardiner. I even took my gloves off in order to take a photograph. The wash of blue—the last remenant of dawn—on Electric Peak also captured my attention. Standing 10,969 ft tall, it’s the highest peak in the Gallatain Range and the sixth highest in Yellowstone. I enjoy being greeted by such a striking neighbor every day from my home. "A thunder-shower was approaching as we neared the summit of the mountain. I was above the others of the party, and, when about fifty feet below the summit, the electric current began to pass through my body. At first I felt nothing, but heard a crackling noise, similar to a rapid discharge of sparks from a friction machine. Immediately after, I began to feel a tingling or prickling sensation in my head and the ends of my fingers, which, as well as the noise, increased rapidly, until, when I reached the top, the noise, which had not changed its character, was deafening, and my hair stood completely on end, while the tingling, pricking sensation was absolutely painful. Taking off my hat partially relieved it. I started down again, and met the others twenty-five or thirty feet below the summit. They were affected similarly, but in a less degree. One of them attempted to go to the top, but had proceeded but a few feet when he received quite a severe shock, which felled him as if he had stumbled. 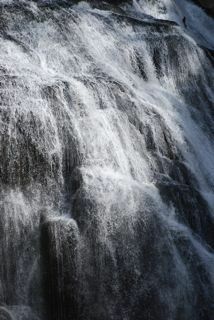 We then returned down the mountain about three hundred feet, and to this point we still heard and felt the electricity." Summer thunderstorms are going to be quite delightful from my porch. I am happy to report that today I walked from my office to the IT department across the street without a coat and I did not freeze to death! P.S. 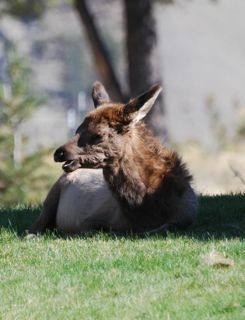 Forgot to post this photo the other day of a bull elk. "Rest of Tonight--Partly cloudy early in the evening then becoming cloudy. A 50 percent chance of snow after midnight. Lows 7 below to 13 below zero. West winds around 15 mph after midnight. Wind chill readings 23 below to 33 below zero." You read that correctly-33F BELOW ZERO!!!!!!! This morning my car staged a revolt and made awful noises when I started it. And you know it's really cold when the bison standing in front of the Mammoth Hotel are coated in ice. I almost wept when I unpacked my shorts--I won't be needing them until maybe July.